“The survival of the fittest is the ageless law of nature, but the fittest are rarely the strongest. I love this Darwin-inspired quote and wish I knew who said it. The psychologist in me just can't over-emphasize how important I think it is for human beings to be adaptable, to "go with the flow" of what life throws at us, to harmonize with conditions. I'm convinced that the more adaptable I can be, the happier and healthier I'll be. It saddens me to see people who are so rigid in their beliefs and habits that they can't learn, make positive changes, grow, enjoy, and fully live. Adapt or die, literally or figuratively. Basic Darwinian natural-selection/survival-of-the-species stuff. In this entry I'll narrow the topic down to the importance of adaptability for endurance athletes, even though I think it's important for folks to be adaptable in every aspect of their lives. How many times have I mentioned "adaptability" and "flexibility" in these journals? Lots! I began back in the 2005 journal when I listed my three main "rules" for our Appalachian Trail Adventure Run: don't get injured, have fun, and be flexible and adaptable (it's in several of the prep pages). I knew even before I began the trek that Jim (my crew) and I would face numerous unforeseen challenges as we traipsed over the Appalachian Mountains from Georgia to Maine. Our adaptability was tested at least once every day, in some form or another. You can also see in our 2006, 2007, and 2008 journals that we have changed or modified our training and our running and travel plans many times to fit each new reality in our lives and the world around us. Stuff happens and we work around it. Not only was this a different kind of year for us (since we didn't camp in WY and CO all summer), it has been a year in which it seems that more than the usual number of other ultra runners and journey runners have also had to adapt to unusual and unexpected circumstances. I think it speaks volumes about the type of folks who seek such challenges in the first place that most accepted their lousy luck and other glitches with as much grace and acceptance as they did. Of course, some weren't so flexible or mature, but they appeared to be a small percentage. Most were able to move quickly beyond the initial disappointment, accept their fate, and set new goals. The longer the event, the more that can go wrong both in preparation and the event itself. for 2 bunions, 2 Morton's neuromas, and 2 gastroc lengthenings in November, 2003.
numerous variables during the event itself, including but not limited to extreme weather conditions (heat, cold, drenching rain, hail and sleet, snow, high winds, etc. ), vandalized course markers, wardrobe malfunctions, crew and drop bag misconnections, stomach issues, rattlesnake bites, ankle sprain, blisters, ad infinitum. A lot can go wrong out there, and the athlete's success in finishing (or maybe even starting) the event depends a great deal on how he or she handles unexpected adversity. In the past some ultras, most memorably 100-milers, have either been cancelled entirely or their courses modified for various reasons beyond the control of race management. Stuff happens. section of the course. 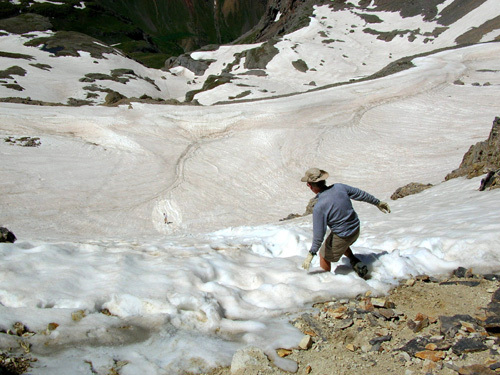 The high-altitude Hardrock Hundred in the San Juan Mountains of southwestern Colorado was cancelled entirely in 2002 because of impassable snow on the course. Other races have been cancelled or modified because of fire damage or threat of fires (Angeles Crest, e.g. ), flooding or threats of flooding from hurricanes and tropical storms (Mississippi 50, e.g. ), other weather-related reasons, and even the 9/11/01 acts of terrorism. Hardrock Hundred course after a pre-race trail work session in July, 2007. But 2008 seemed to throw down even more challenges to ultra runners than most years. Several large races in the western part of the U.S. and at least one smaller one in the East were affected this year by a higher- or later-than-usual snow pack, wildfires, and flooding. I'll highlight four of the more prominent hundreds and a new 50K/50-miler that were either cancelled or modified, testing the resilience of not only the runners but also everyone else associated with the races. 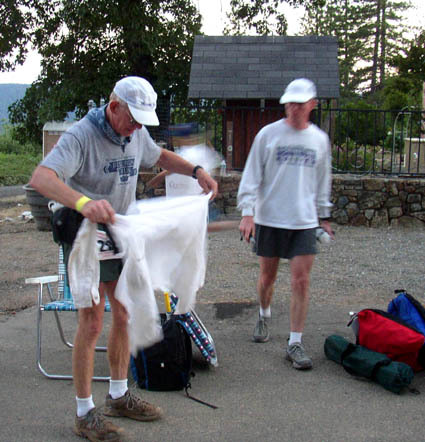 Jim and I have run the Bighorn races (50K, 52-miler, and 100-miler) several times in the last eleven years. They were close to our home in Billings, MT and definitely worth the drive from Virginia to attend twice since we moved 2,000 miles east (see our 2006 and 2007 journals). It wasn't until May that we decided for sure (well, mostly sure!) that we would NOT be going on our third annual camping trip to the Bighorn, Hardrock, and Leadville races this summer. The reason had nothing to do with snow, however. That higher-than-normal snow pack I mentioned out West this year? It made the Bighorn Mountains even more wild and scenic than usual. Shortly before this year's race both the 52- and 100-mile courses had to be rerouted from the higher elevations (approximately 8,000 to 9,200 feet) near the Porcupine Ranger Station. Runners had to scramble to wrap their brains around new aid station and drop bag locations, re-write their pacing charts, and educate their crews and pacers -- but at least they still got to run part of the original course and race management retained a similar amount of the elevation gain and loss (it wouldn't have been much fun if they'd made it easier, now would it??). Folks who had run the course previously had mixed reviews. The adaptable, glass-half-full types embraced the changes and enjoyed the race. Inflexible, glass-half-empty ones were not as happy, and I'm guessing it affected their ability to put forth their best efforts. It takes a lot of energy to gripe and moan when life throws you lemons. Adaptable people make lemonade. Gorgeous scene along the HRH course near Handies Peak. Photo taken 7-7-07 by Jim. It's always fun for Jim and me to keep track of the numbers, whether we're going out there or not. Each week this past spring we watched as the snow accumulated higher and higher. There was internet chatter that the race might be cancelled. Not only were entrants quite concerned about this (after all their training and planning), so were we as potential volunteers and "friends of the race." So were a LOT of folks involved with the race. Fortunately, on May 27 the decision was made: the 15th running of the HRH race was officially a "go." You can bet there were a lot of happy people when that announcement was made! Yes, there was snow on some parts of the course but most of it was melted and the race went on as usual. About the same percentage of runners finished as usual, and 23-year-old Kyle Skaggs ran a phenomenal race, taking over three hours off the course record (that's an outstanding ultra running achievement). We're sorry we weren't there to run the Cunningham aid station and enjoy the show again. We WILL be there next year (we hope). Marking the 2007 race course between Kamm Traverse and Mineral Creek. Photo taken 6-30-07 by Jim. And if the race hadn't been held? There would have been at least 135 very disappointed runners (and a lot more friends of the race). Qualifying standards are tough. Once qualified, chances of getting in are low and are weighted in favor of previous finishers. The race has a very complicated lottery and there were more people on the wait list this year than ones who were originally accepted. Once accepted, training is (or should be) tougher than that of most other 100-milers because the course is tougher than most other 100-milers. It's definitely "post-graduate" level. So to go through all those hoops and then have the race cancelled six weeks before it's set to be run . . . well, that would be a major disappointment. But it's happened before, and it will probably happen again. Runners, volunteers, race management, crew, pacers, observers -- all have to realize that possibility and deal with it if it happens in the future. This is one race in which Jim and I will probably never participate but I enjoy reading about it and following runners' progress online during the race because we always know some of the participants. Two runners on the long road to Whitney Portal during the 2008 Badwater 135-mile race. Photo taken on 7-14-08 by Lisa Bliss. The 31st running of Badwater was held in July on paved roads through the deserts and mountain ranges of Death Valley in southern California. It's so hot the pavement looks like it's melting in some photos I've seen, so just try to imagine what it's like to be out there running and walking those roads for up to 60 hours during the race. 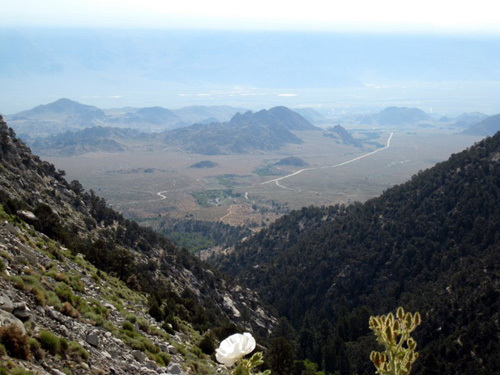 It starts at the lowest elevation in North America, 282 feet below sea level in Badwater, and ends at the trailhead to Mt. Whitney, Whitney Portal, at 8,360 feet. 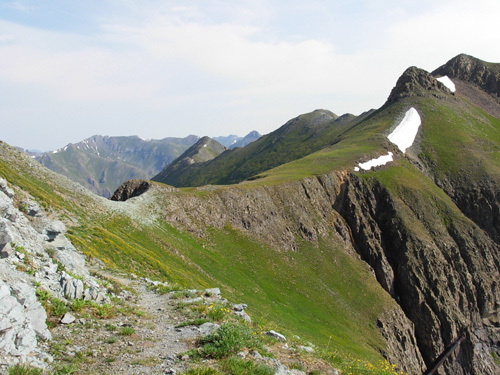 Like Hardrock, this race is difficult to enter and difficult to train for. It's got excessive heat (it can be 130º F. and higher), glaring sun, hard pavement, and lots of elevation gain and loss (mostly gain). Some people get their full money's worth, taking right up to the 60 hours allowed for an official finish. 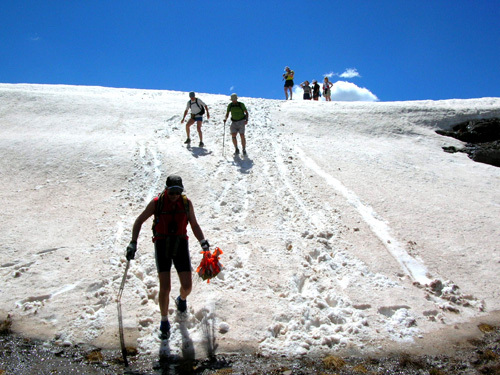 Others with permits to climb Whitney go on to the 14,000+ foot summit after the race. On top of that (pun intended), there are very strict crew requirements and rules. Badwater sounds almost as tough on the crews as on the runners. If this race is cancelled or modified radically, it's a Big Deal to the people who are involved. Looking back down at the race course from the road to Whitney Portal. Photo by Lisa Bliss. Let me tell you a little story about this year's race, which presented one more obstacle to which runners and crews had to adapt, at least temporarily. Different runners reacted in different ways, as you'd expect. "At one point on Monday afternoon, race organizers advised competitors of a finish location change - the plan was for racers to continue as normal to mile 102.9, then turn around and run back to Panamint Springs, a distance of 133.5 miles - only to reverse this notice a few hours later after a concerted effort by the California Department of Transportation, who put six road graders into action when a flash flood shut down the race course near Lone Pine." 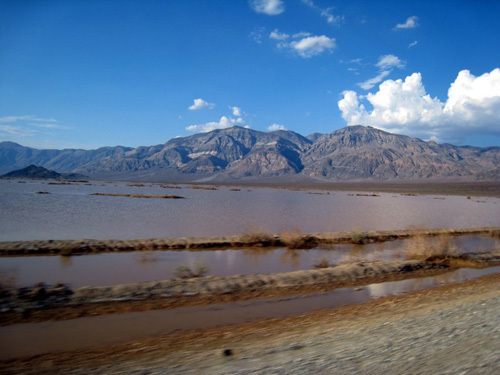 Part of the desert that was flooded during the race. Photo by Lisa Bliss. Irony of ironies, a part of this desert course was flooded in July! That happens during late spring snowmelt, sure, but in July?? (Maybe it's more common than I think.) All the race participants, and particularly anyone planning to summit Whitney and/or do a Double, must have been very disappointed with the first news, then elated to discover later on that the road was clear and their original plans were still good. At least two of the runners continued with their original plans to complete a Badwater Double: Anita Fromm (shown in the next photo) and Danny Westergaard. In fact, Anita set new women's records for both the race and ascent to the top of Whitney (52:17 hours) AND the Double (129:44 hours). I don't know how many other runners summitted the peak and/or did the Double. At least one experienced Badwater runner planning to do a Double chose to drop out after hearing the news of the re-route. He must have been pretty frustrated several hours later when the original course was re-opened. Based on what I've read and heard about him, he'll be back for another try. Anita Fromm (L) during her Badwater Double record-setting run. Lisa Bliss on right. I think it took a lot of determination and optimism for Anita and Danny to stay out on the course after the first announcement meant their original plans would be ruined. I have no idea what went through their minds, or the discussions they had with their crews. But I'm sure they were both very relieved to find out several hours later that the original course -- and the opportunity to summit Whitney -- was still a "go." Good job, you guys! That's some admirable adapting (twice during the race) to unforeseen circumstances. Probably the summer's biggest disappointment for hundreds of ultra runners, volunteers, race management, crews, pacers, and interested observers was the cancellation of this prestigious race only two or three days before the start -- not rerouted or rescheduled, completely cancelled for this year..
Talk about difficulty getting into an ultra! The odds of gaining entry into the 36th running of the Western States 100-mile foot race this year were only about one in six. It's gotten tougher and tougher each year to get in. As I recall, the odds were about 50-50 when Jim and I both got in in 2001. Jim also lucked out in 2004. Jim (L) at Michigan Bluff aid station (55 miles) in the 2004 race. Jim, Jr. (R) helped crew and pace. The race has gotten so popular that the "two-time loser rule" was going to have to be scrapped or modified in 2009; there were now so many hopeful entrants who had been turned down the previous two years that they would no longer gain automatic entry on their third try. Little did anyone know before June 25 just how ugly this would get (although considerably less ugly for race participants than for residents of the area and lovers of forests). The run was scheduled to begin on Saturday, June 28. No one told Mother Nature, however. Very dry conditions in the California mountains resulted in almost a thousand wild fires during June. Firefighters were stretched to the max from one end of the state to the other. 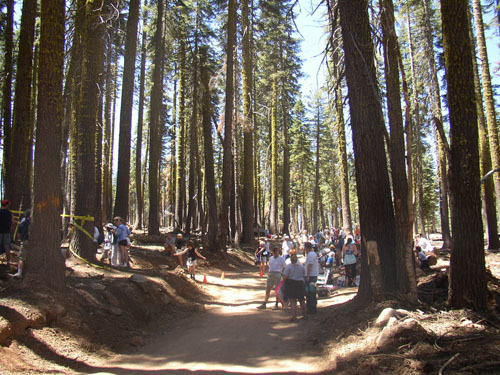 Additional teams were being flown in from around the country to help them save lives first, then structures, then forest trails like those near the Western States course. It was difficult to contain the two or three fires raging in the deep, rugged canyons close to the WS course and the air was thick with acrid smoke. The situation was looking pretty dire. fires in the first third of the course caused a reroute over the next three years. The race's organizers are currently working on a revised schedule of runner activities for Thursday and Friday in Squaw Valley, and these details will be made available soon. Although there will be no race for the first time in our 35-year history, we still wish to make this experience as meaningful as possible for our runners. 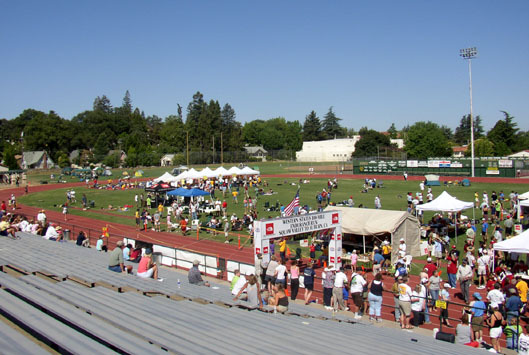 Activities will include annual events such as runner check-in for goodie bag pickup on Friday morning, the pre-race briefing and raffle on Friday afternoon, the showing of Western States documentaries on Friday night, and a special gathering of runners commemorating the race's start on Saturday. Since the beginning of more than 840 wildfires statewide, 312 wildfires in northern California and more than 3,200 lightning strikes in the Tahoe National Forest alone on June 21, the race's organizers have worked closely with a variety of local, county and state agencies in determining the best course of action for our race. It has become apparent that given our race's paramount concern - the safety of our runners - holding this year's race would pose too great a risk to our runners, to our aid station personnel and to our volunteers. 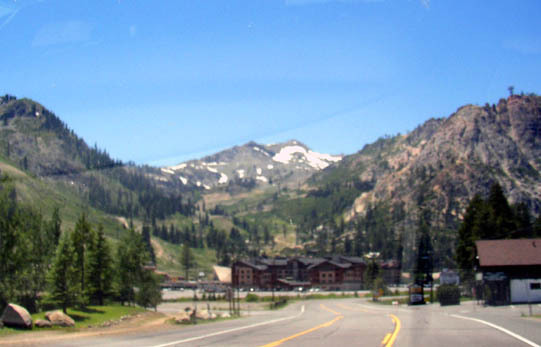 Given the close proximity of at least two fires that are within two miles of our race course and a critical access road, as well as the deteriorating air quality stretching from our start in Squaw Valley to Auburn, Calif., the board has determined that cancellation, rather than postponement or the use of an alternative course, represents the safest and most prudent decision for our 2008 event." "For all of you, today's news is disappointing. Since the lottery was held in December, you have trained with remarkable diligence and focus to get to this day. You have dreamed big and made countless personal sacrifices to prepare for one of the greatest days any trail runner can ever have. 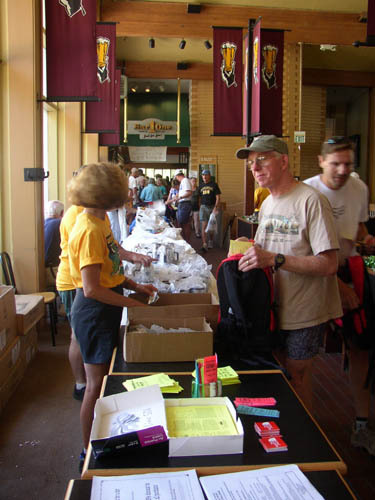 As a group, the Western States Board would like to commend you for your dedication and devotion not only to the preparation that is required for our race, but to the community of trail runners of which we are all a part. You are members of a special group, one that relishes challenge, constantly strives to improve the limits of what is believed possible, and seeks the special kindred spirits of others who revel in the beauty of our sport. We have been honored to have your name as part of our race's start list this year." I know how excited I was to have the opportunity to run this race eight years ago. It truly is the "Boston of Ultras." I tried very hard in the 1980s to get qualified for the Boston Marathon, and running it twice was memorable. Same with Western States. As soon as I worked my way up to running 100-milers, I had a goal to run WS. Even though there are now about fifty 100-milers in North America -- more than double the number of 100-milers from which to select a decade ago -- running Western States is still a goal of many ultra runners. They're all special but WS is extra special to many of us and we want to run it at least once. So I can well understand how disappointed all 400+ runners, their families and crews, pacers, volunteers, and race officials were when this venerable race was outright cancelled. A lot of time, money, and preparation went into it. Most folks had already flown or driven to the event, many with their families. Whether it was their first time there, or their 20th, they were psyched to run. Crews wait for their runners at the Little Bald Mountain aid station (28.6 miles) during the 2004 race. It was interesting to read the flurry of posts that hit the ultra lists the next few days. The content was "all over the board." A few folks were whiny and/or criticized the decision on various levels. Many runners who weren't in the race expressed empathy and/or sympathy to the ones who were. One woman (also not in the race) was outraged at the expressions of sympathy, arguing that "condolences" should be reserved for the dead. That generated more posts. But most of the posts were "lemonade from lemons" types of responses from race participants that showed how adaptable ultra runners can be after they've done the initial cursing at their bad luck and soon decided how to make the best of the situation. There were still some pre-race activities they could enjoy if they were on-site. They could socialize (and commiserate) with the other runners who had already gathered for the race. Although they couldn't see the beautiful scenery at Squaw Valley because of the thick haze of smoke, some runners did hike up to Emigrant Pass without endangering their health too badly or interfering with firefighters. Families went ahead and enjoyed their vacations. Runners made new plans. Life went on. (Jim finished in 2001 but not 2004; he timed out at 93 miles, which was a heartbreaker. And some other good things came out of this (besides the fires being put out eventually): other races like Vermont, Tahoe Rim Trail, and Angeles Crest opened up some new spots for Western States runners who wanted to do another 100-miler this season. Arkansas Traveler became a substitute race for States in the Grand Slam (but apparently not the Last Great Race). 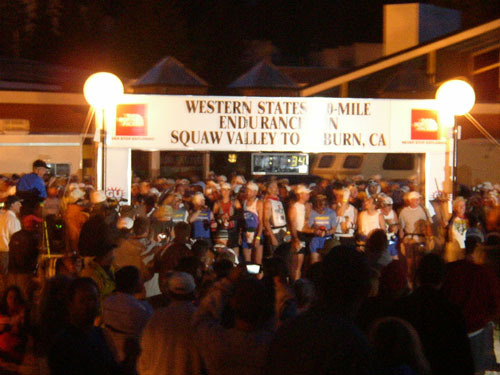 And everyone who was on the final start list for the 2008 WS100 is now on the list for the 2009 WS100. That's not so good for the folks who didn't get in this time, but it's a fair solution to the runners who were cheated of the opportunity to run it this year. This has been a very active hurricane season in the Gulf of Mexico and Atlantic Ocean. After Hurricane Gustav wreaked more havoc on New Orleans and the Gulf coast recently, there were forecasts of high winds and huge amounts of rain along the eastern seaboard from the next storm in the alphabet, Tropical Storm / Hurricane Hanna. Fifteen or twenty renegade runners and additional support crew showed up to run the race anyway. They reportedly had fun in the heavy rain, modified the course during the run to avoid waist-deep streams of water, and survived the storm. It's not the first time a race has been cancelled and an unofficial run has been held by runners who are "all dressed up with nowhere to go." At first I thought, good for them! They adapted in their own way and had a good time. As long as the venue wasn't in a park or other area that was closed, it's a free country and they can take whatever personal risk they're comfortable with. Then I started to realize that this "damn the torpedoes, full speed ahead" attitude could have gotten them killed -- just like a couple of the risky decisions I made on my AT trek. 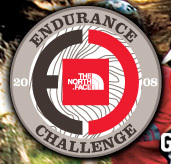 The The North Face race was cancelled for good reason: as stated on the TNF web site, "the required rescue and medical services" would not be available to the runners. 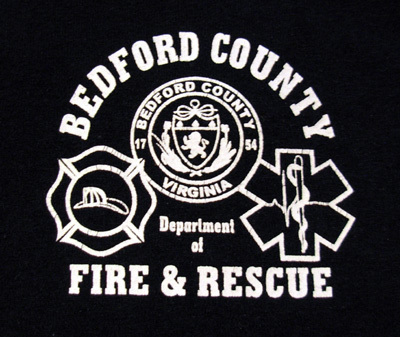 First responders had higher priorities than rescuing silly runners!! I come by this new realization honestly -- Jim's an EMT and fireman, covering at least two of the categories of "first responder." That gives me a new perspective on risky behavior: It's one thing for a runner (or anyone else) to risk his or her own life doing something risky by choice. It's quite another to put someone else's life at risk whose job (or volunteer mission) it is to rescue them. What if one of the runners was injured and had to be rescued during the height of the storm when the fire department, rescue squad, police, and medical personnel were busy with hapless victims who didn't choose to be out in the storm? Even if they could respond, why should they risk their own lives from high wind, high water, downed power lines, and who knows what other hazards? And what is the likelihood in this litigious, it's-never-my-fault-it's-someone-else's-fault culture that the victim or his/her family would actually assume personal responsibility for their decision to run the renegade race? Just some things for extreme athletes to think about -- including myself. We want to push our mental and physical boundaries and have grand adventures, but we need to weigh the consequences of our decisions, like the risks to ourselves. I've voluntarily and/or inadvertently put myself into several risky situations out in the wilderness over the years without thinking too much about the cost involved with a search or the people who might have to rescue me. 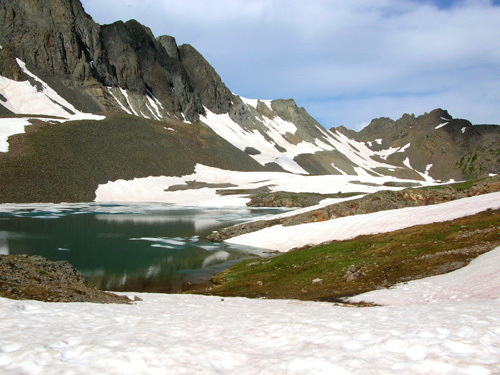 The state of Colorado has a good approach to part of this problem with their CORSAR program: Colorado Outdoor Recreation Search & Rescue cards are inexpensive to purchase and save victims the monetary cost of being rescued, if that becomes necessary. It still doesn't mean folks should be careless in the wilderness but it's good "insurance" and helps defray the cost of rescues. The danger to the rescuers is still there, however. 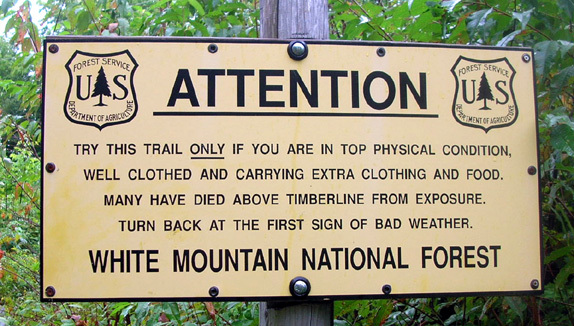 Warning on trails leading to Mt. Madison in New Hampshire. I'm getting less and less prone to choose risky adventures as I get older and value my life more. Even though I was quite proud of myself for getting over Mt. Madison in a blizzard and plowing through four raging streams in the Hundred Mile Wilderness three years ago on my AT run/hike, I get the willies thinking about those two days in retrospect. I could have died in either situation and I could have put other people's lives at risk who tried to rescue me or recover my sorry carcass. I still love adventures, but I think I'll keep them more "lite" from now on and do my best to avoid an unnecessary rescue. WHAT ADAPTATIONS WILL BE REQUIRED NEXT FOR US? Speaking of hurricanes, our own recently-stated race and travel plans may have to be adjusted. After Hurricane Ike battered a huge area of Texas and Louisiana two days ago, I'm wondering what Huntsville State Park just north of Houston looks like. We haven't entered Sunmart yet. 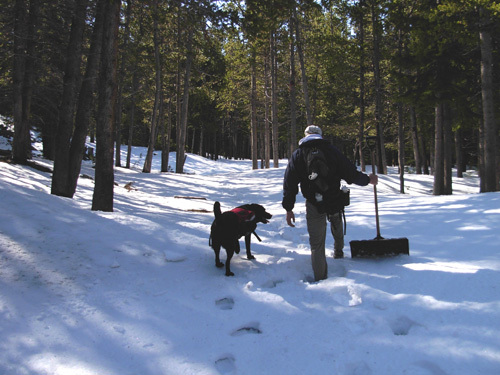 Will the park trails be cleared by early December? Will the race be cancelled or rerouted? Can we camp there again? We'll have to wait to see. We are registered for Ultracentric near Dallas in two months. Hopefully, there isn't much damage there and we'll be able to run that race. Jim and I may have to change our plans yet again, and that's OK. We're resilient. We usually have a Plan B and C. It's a minor inconvenience for us, compared to what the residents face. Our main thoughts are for the people who live there, the ones who are directly impacted in many ways. 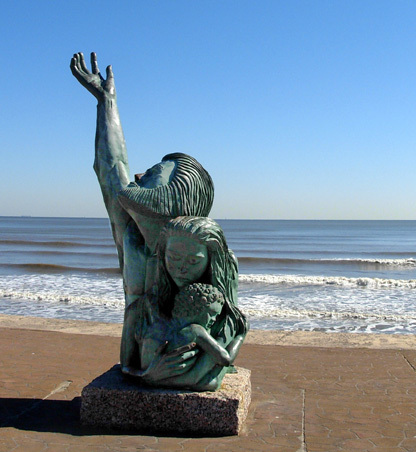 It's so sad to see the early pictures and videos from Galveston Island, which took the most direct hit from Hurricane Ike. 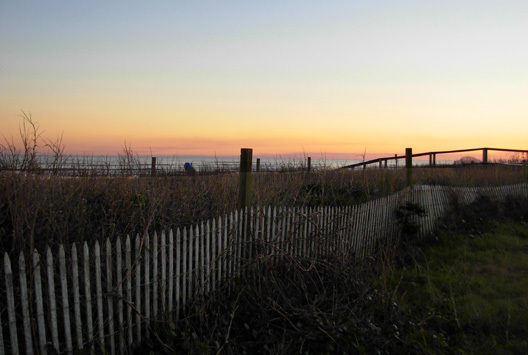 I'm glad we had the opportunity to explore the island in February while it was in its glory. It was a great place to visit. We hope the city and island recover as quickly as possible. We thought we might go back in January or February. Now I doubt we will. 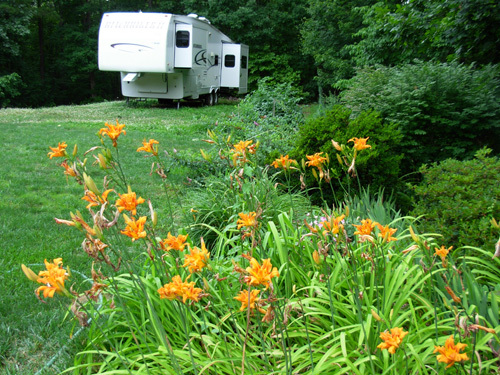 It depends on whether the state park campground is open by then. I read that it may take an entire year just to clean up all the debris! I'm sure the local economy could use some of our tourist dollars, just like New Orleans after Katrina's devastation. Tens of thousands of people along the Texas and Louisiana coast are now homeless. Many are also jobless. Fortunately, the death toll was relatively low. The tragedy touches on several themes in this essay: making risky choices (living in a vulnerable area in the first place, defying orders to evacuate), assuming personal responsibility (evacuating to a safe place before the storm hit, having a Plan B in case of an event such as this, not feeling entitled to be taken care of by the government), and putting the lives of other people at risk to be rescued (about a thousand who refused to evacuate called 911 during the height of the hurricane; Darwin at work). All the victims, including the ones who acted responsibly, have a lot of adapting to do in the coming weeks and months. I can't imagine dealing with all the problems they will have. It sure puts into perspective how relatively inconsequential are the adaptations we ultra runners have to make when a race is modified or cancelled! Life is unpredictable. Stuff happens and we need to be able to make conscientious, reasoned decisions about how to adapt to the bad stuff. I hope I can continue to adapt, accept, and harmonize with the changing conditions that I'll face the rest of my life; figure out how to have more adventures without endangering myself or others too much; and accept total responsibility for the decisions I make. Hopefully that will help me live a longer, happier life!